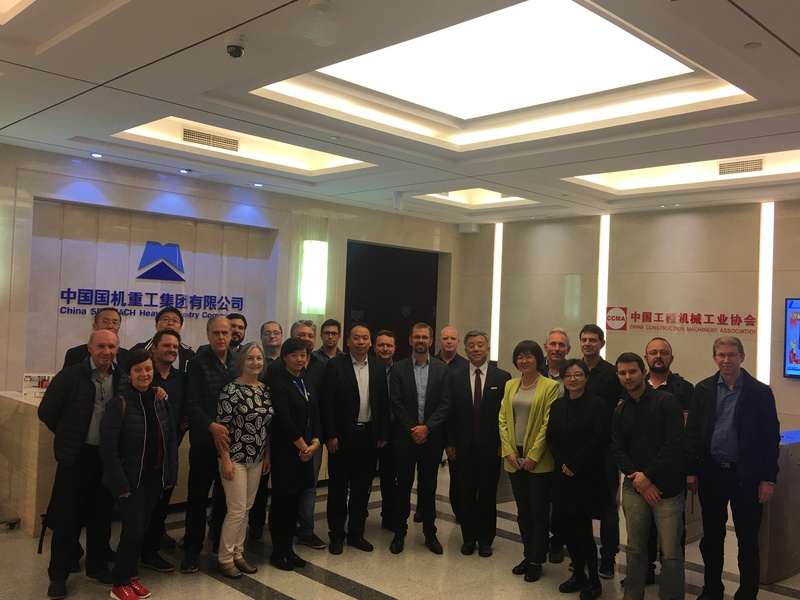 On the afternoon of October 22nd, Mr. Daniel Hinna, Mayor of Panamby, the southern city of Brazil, led a delegation of government to visit China Construction Machinery Industry Association (hereinafter referred to as the “CCMA”). The two sides took a extensive friendly communication on the trade and investment cooperation between Panamby and China construction machinery industry. Mr. Lv Ying, deputy secretary-general of CCMA and general manager of Beijing Asiamachine International Convention & Exhibition Co., Ltd., expressed warm welcome to the Panamby delegation, as well as gave a detailed introduction to the CCMA, the development status of China construction machinery industry and the China (Beijing) International Construction Machinery, Building Materials Machines and Mining Machines Exhibition & Seminar (referred to as BICES). He said China-Brazil friendship has a long history. Many Chinese construction machinery manufacturers such as Sany, XCMG and Zoomlion have set up factories in Brazil and played an active role in promoting trade between two countries. CCMA as the industry authority will continue to promote cooperation between China and Brazil’s construction machinery industry. As the representative of China construction machinery industry enterprises, Mr. Zou Xuesong, executive deputy general manager of SINOMACH, briefed the Brazilian delegation on the development of SINOMACH and the trade cooperation with Brazil. As the largest country in South America, Brazil has always been the key market for SINOMACH. So far, it has exported a large number of construction machinery products to Brazil. In particular, since President Xi proposed the “One Belt, One Road” initiative, SINOMACH has been more active in promoting cooperation with Brazilian enterprises. Mr. Zou also expressed the hopes to establish a closer cooperation relationship with Brazil in the future. On behalf of the Brazilian delegation, Mr. Myor of Panamby Daniel Hinna, expressed his gratitude for the warm reception and thoughtful arrangement of CCMA. He aslo expressed good wishes for inviting Chinese construction machinery enterprises to Panamby to invest. The secretary of the city's economic and environmental department, said that Panamby is an important transportation hub, located at the southernmost tip of Brazil, close to the border of Uruguay, Argentina and Paraguay. The city is developed with agricultural industry and produces more than 65% of combine harvesters in Brazil, such as John Deere etc have factories in the city. In addition, there are also world-famous construction machinery parts factories such as Caterpillar and Volvo. In the future, Panamby plans to actively expand cooperation with Chinese enterprises using its geographical and industrial infrastructure advantages. During the conversation, the two sides also held a warm and friendly discussion on the quality of China's construction machinery products and the prospects for the development of Brazil-China trade etc. After the talks, Mr.Zou led the Brazilian delegation to visit the SINOMACH exhibition hall. The development of SINOMACH reflects the great growth process of China's construction machinery industry. The members of the delegation are amazed at the brilliant achievements of China's construction machinery industry in the past few decades and are full of bright hope for cooperation with China's construction machinery industry. The two sides agreed in September 2019, BICES 2019 to meet again!